Designed to add punch to your music that even the most demanding of bass heads would be impressed with. 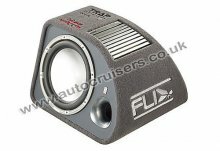 FLI Active enclosures come with a built in amplifier purpose built to power the driver. With curved metallic heat-sync the amplifier sits neatly into the enclosure finished off with a flared for smoother airflow. Passive enclosures do not come with a built in amplifier and require powering from an external amp. They come complete with the same styled enclosure and flared ports. Model: FLI Trap 12 Active.